Maria Minerva’s profile on Soundcloud gives an insight into the mind of one of the most intriguing pop artists of today. Her newest album ‘Will Happiness Find Me? is compelling electronic pop that’s bursting in creativity and quirky inventiveness. All tracks on the album were written, produced and performed by Minerva and recorded in Lisbon, Portugal throughout winter 2011/12. Earlier this year, Canadian artist Grimes released ‘Genesis’, an album of avant pop that quickly became her crowning jewel and mass stardom ensued. Similarly, Maria Minerva’s star is on the rise and with the release of ‘Will Happiness Find Me?’, I feel Minerva overtakes Grimes as the most accomplished avant pop artist of 2012. 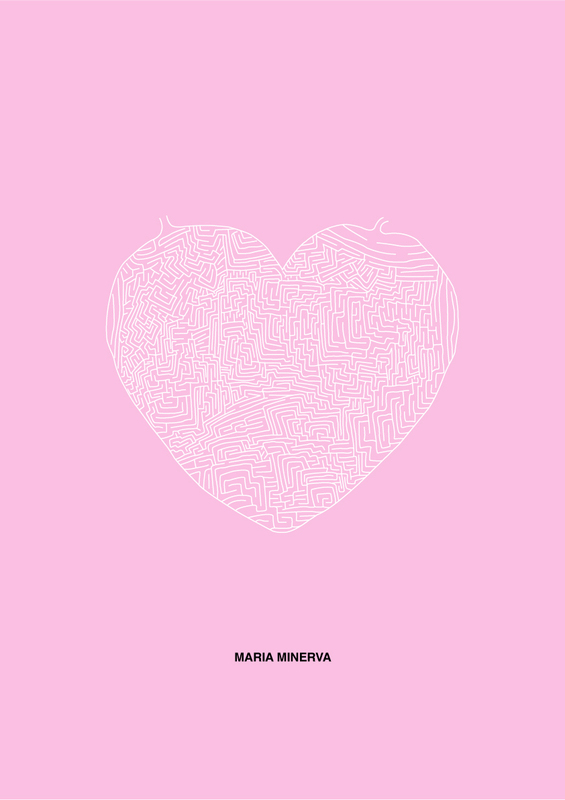 Minerva’s latest album was released on the prolific L.A based label Not Not Fun in October. Minerva cites Brian Eno, Throbbing Gristle, Cabaret Voltaire and Moodymann as her influences. Certainly, while listening to the pop creations on ‘Will Happiness Find Me?’, a plethora of sounds and styles are effortlessly fused together by the young avant pop and lo-fi producer. ‘The Sound’ begins the album and was the first single released in late summer. Bright colours of compelling sounds are dotted on a canvas of hazy production and infectious pop. The freshness of ‘The Sound’ is what’s immediately apparent. A spoken word sample is first heard, “what if the wave could beat them/the waves of the ocean”. Soon, the beats and sunshine textures of ‘Pause’ era Four Tet soundscapes fill the headspace. Minerva sings over a perfect dance beat, “the sound of love, the love of sound” as ‘The Sound’ comes to a terrific close. It is indeed the sound of 21st century folk music. ‘Heart Like A Microphone’ flows in a haze of dreamy production and slow tempo of psych pop delight. Minerva’s lyric “My heart is like an open door/Just walk in” drifts slowly amidst the cloud of sound. ‘I Don’t Wanna Be Discovered’ is sunshine pop augmented with urgent beats. Keys and electronic bleeps are introduced to the mix on ‘Alone In Amsterdam’. An ambient symphony of drone warped sound is created here. Further sonic depths are tapped into during ‘Alone In Amsterdam’. Sublime. The ambient works of Brian Eno is on display beautifully here, where feelings of loneliness and isolation abound. ‘Sweet Synergy’ is full of sweet, glistening beats and echoes dubstep and grime in the vein of M.I.A. Minerva sings “fast love fast life” continuously over irresistible pop laden hooks and dubstep groove. The album’s second single ‘Fire’ features Chase Royal who adds hip hop to the electro pop of Minerva. ‘I’m Coming Of Age’ is reminiscent of Lindsrom & Christabelle’s collaborative work. Dubstep and avant pop fuse together wonderfully, “I feel this strange urge in myself/I’m coming of age and this is only the start” Minerva sings over compelling beats. The album’s highlight is most certainly ‘Never Give Up’. Minerva’s heartfelt vocals are delivered with emotion. Darkness is hauntingly present within the sphere of sound. A melodic piano line runs throughout. Electronic beats and ambient synths flows the keys and atmospheric vocals. Minerva’s refrain of “I’ll never give up” has shades of prime Cocorosie and Sweden’s Molly Nilsson. After four minutes the track stops before an irresistible guitar hook appears accompanied by futuristic beats. Minerva has guided the listener on an interstellar journey during these six minutes; the refrain of “I’m born again” closes ‘Never Give Up’. More genres are covered on the album’s final two tracks. ‘Mad Girl’s Love Song’ contains reggae/dub infused with infectious pop. Think Studio One mixed with the Hyperdub label. ‘The Star’ is complete with a Joe Meekesque pop sample played beneath Minerva’s own distinct pop. “My garden is my mind” is a lyric from ‘Will Happiness Find Me?’ and epitomises Minerva, whose compelling avant pop creations are so vivid in colour and her matured songcraft is undeniably in full bloom. ‘Will Happiness Find Me?’ is out now on Not Not Fun.